Choose from over 60 classic flavors, and discover the rich taste and quality consistency in each and every DaVinci Gourmet product, including this sugar free almond flavoring syrup! This syrup is sweetened with sugar free, no-calorie Splenda Brand sweetener, to complement your beverages without overpowering them too much sweetness. They are specially formulated to resist curdling in milk and hold up well under heat, making them the perfect choice for espresso-based drinks, coffee, and lattes. Use this syrup to create skinny vanilla almond lattes, creamy milkshakes, or toasted almond martini. It can even be used for drizzling atop your cheesecakes and frozen yogurt for the perfect finishing touch, or as an ingredient in a wide array of baked goods! I recommend adding a half pump of this syrup into every coffee drink. It adds subtle notes in the after taste that is very enjoyable. The DaVinci products are the best in the coffee flavor business. This item comes in a plastic bottle that makes for easy shipping to our customers. 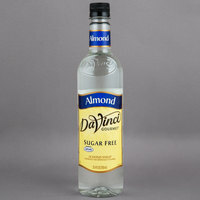 The sugar free almond syrup is terrific and a great way to make a low calorie cocktail that still tastes great. The syrup is excellent and love that its clear color. I am a huge fan of almond flavoring and almond syrups. This is good to drizzle on deserts or just use in your coffee or hot chocolate. This is however not nearly as good as the full sugar versions. This is a good one. It has a good almond nutty taste to it. It helps to enhance coffees and more. The sugar free is a plus because you can then feel less guilty about using more of it. The Dolce Almond Sugar Free Coffee Flavoring Syrup is delicious and an excellent way to sweeten your coffee. I will definitely be ordering this product again.